Even though you might not be able to tell from the way I dress, I enjoy reading about fashion and watching fashion-related TV shows. So I couldn't resist picking up this unique middle grade novel about a young fashion designer. Emma Rose is SO not a diva. She doesn't want her turn on the catwalk-she'd rather be behind the scenes creating fabulous outfits! So when a famous fashionista discovers Emma's designs and offers her the opportunity of a lifetime-a feature in Madison magazine (squeal! )-Emma sort of, well, panics. She has only one option: to create a secret identity. 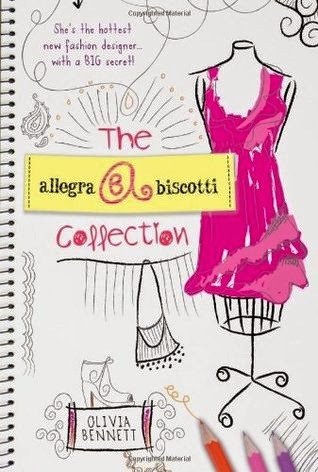 And so Allegra Biscotti is born. Allegra is worldly, sophisticated, and bold-everything Emma is not. But the pressure is on. And Emma quickly discovers juggling school, a new crush, friends, and a secret identity might not be as glamorous as she thought. It was fun to be in on Emma’s secret identity as Allegra Biscotti. I was intrigued by the problem of how she’d keep up her secret identify and finish designing her collection, while at the same time continuing to act like an ordinary middle school student with typical school issues— keeping friends, crushing on boys, and who to sit with at lunch. I really liked the sketches of Emma’s designs that were sprinkled throughout the story. This was definitely a fun read for anyone interested in fashion! When I put on my writer’s hat, I noticed how the author used details to show the world from Emma’s perspective, describing the details of their outfits and accessories, the feeling of fabric, her thrill at sewing a new design. At one point, it was interesting that the author “broke the rules” of writing middle grade by having an adult step in to help her with a tricky sewing issue, but if anything, I thought it helped to make the story more realistic. Looking for more great middle grade reads? Visit Shannon Messenger's website for a list of bloggers and their picks for Marvelous Middle Grade Monday! It's a very gloomy Monday here - the perfect day to snuggle up with a good book. This one has a bit of magic in it, though if you are a big fan of Harry Potter, this probably isn't the kind of magic you're looking for. The real magic in this story is the magic of love, family and people caring about each other. The fun twist on magic was a nice concept that intrigued me. I especially liked the idea of “word collecting”. 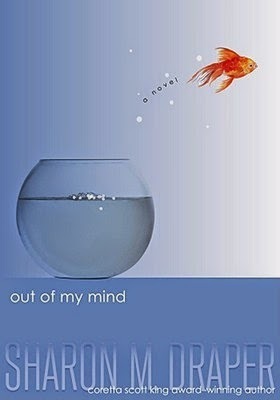 I’m not a big fan of novels that contain lots of little stories about people, but if you like books about small towns and the quirky people that live there, you’ll enjoy this book. As a character, Felicity is charming and caring and I was hoping throughout the story that she’d get what she wanted—to stay in Midnight Gulch. From a writer’s perspective, I enjoyed and admired the language and phrasing in this story. I could tell the writer worked hard at creating Felicity’s unique voice and expressions. This is a good one to study carefully to see how the author brings a character to life. Natalie Lloyd owns a very sweet dog named Biscuit. 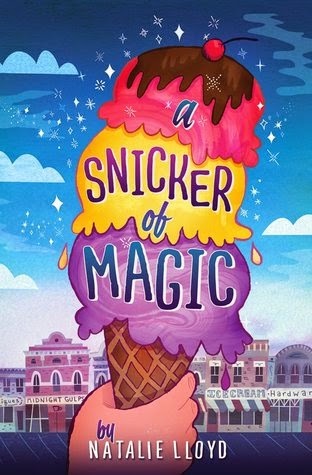 A Snicker of Magic is her first published book. For more, visit Natalie Lloyd’s blog or find her on Facebook. Summary from Amazon: Bear and Bird are best friends. They live together in the middle of a beautiful forest. Bear and Bird have been planning an adventure all day - but when Frog turns up unannounced, Bear is so excited he forgets all about Bird. Bird is sulking because his big plans have been spoilt. But when Bear and Frog find themselves in trouble Bird has to swoop to their rescue - perhaps he will get his big adventure after all! 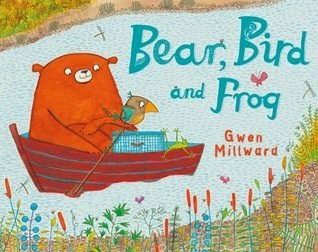 Bear, Bird and Frog, written and illustrated by Gwen Millward, published by Egmont Books, 2014. The concept of two friends leaving another one out came across really well with the animal characters in this story. This situation happens a lot in classrooms and day cares, so it's a theme children can easily relate to, yet it also has the possibility for much discussion about feelings. This book was a good one for studying picture book structure: the problem of the story was introduced within the first ¼ of the book, then it escalated and the reader could connect with Bird’s feelings, and in the last ¼ of the book, there was a crisis and Bird came to a realization. For me, the realization was a bit contrived since it became evident through a reaction to circumstances, but that may be just a matter of personal taste. I don’t think it would bother young readers. Any early primary students will easily relate to Bird and the feeling of being left out. This book will be useful to spark discussions about feelings and strategies to cope with them, as well as what it means to be a friend. I am always on the lookout for good books to help children understand that sometimes it’s okay for a friend to sometimes play with someone else. A good activity for this book would be for students to take the roles of different characters (e.g. Bird, Bear, Frog) and talk about what happened from their point of view, to get different perspectives on the situation. The ending also invites the reader to imagine things the friends could do the next day, so another great activity would be to have students draw and write about what happened next. If you're looking for more great picture books to read to your class or to investigate as a writer, author Susanna Leonard Hill has a wonderful list of Perfect Picture Books, categorized by theme and topic. If you've been following my blog, you know I enjoy listening to podcasts while driving, mopping floors or walking the dogs (and there are more walks now, with three dogs). This summer I discovered a new and interesting podcast for writers, readers and librarians of children's books. This podcast has been around for just over a year. Host Librarian Matthew Winner interviews "authors, illustrators, kidlit notables, education luminaries, and everyone in between." I just finished listening to Matthew's discussion with Drew Daywalt, author of the best-selling picture book, The Day the Crayons Quit. It was inspiring to hear that it took almost ten years for Drew to get the book published. It just shows that it's true that you should never give up! If you want to get a sense of some of the great podcasts available, Coming Up On the Let's Get Busy Podcast lists the top five downloaded episodes. Matthew Winner is an elementary school teacher-librarian. He also has a blog, The Busy Librarian, where he highlights some of the content of the podcasts, as well as providing reviews of children's books, book trailers and other tidbits. A great resource for teacher-librarians and elementary school teachers! I usually do a lot of reading over the summer, but this year was different. I ended up doing more writing than reading—when I wasn’t caring for the three dogs, that is. Of the few books I did manage to read, this one stuck out for me as meaningful and one I’d definitely want to read again. This was a powerful and moving story. It gave me a glimpse into the perspective of someone with a life very different from my own. This is a wonderful book for students and classroom discussion. I enjoyed the twists and surprises in this book from several events that I didn’t see coming. I also appreciated the way the ending wasn’t too neatly wrapped up, just like real life. As a writer, I especially enjoyed the main character’s voice. It gave her so much personality and really brought her character to life, which was so important in this story since Melody couldn’t speak. Sharon M. Draper lives in Cincinnati, Ohio with her husband and their golden retriever. Out of My Mind and her other books have received many awards and honors – far too many to list here. She has been honored as National Teacher of the Year and is a five time winner of the Coretta Scott King Literary award. For more, visit Sharon M. Draper’s website. Don't you love the stuffed toys on this newspaper airplane? This cover caught my eye and, after a few late summer evenings of sitting on the deck admiring the stars, I had to read it! Have you ever wanted your very own star? Wouldn’t it be wonderful to have your own star for a nightlight? It is this thought that begins Hopper and Wilson’s second adventure. They fill their airplane with lemonade and soar into the night sky. So many stars to choose from! One is too pointy. One is too heavy. Another is too bright! Taking a break on the moon, the two friends look directly above and spot it—the perfect star! As Hopper lays down for a nap, Wilson ventures off on his own, to the dark side of the moon. Yet now he is lost! How can he find his way back to Hopper? The perfect star, of course. Wilson spots it in the sky and follows it back to his friend. 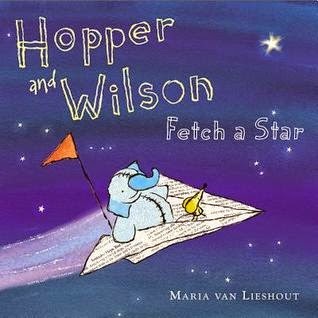 In another deceptively simple story, Maria van Lieshout shows how sometimes the best part of nature is that it’s only found in nature—and that everything has its proper place…be it stars or even best friends, who always belong together. I liked the unique concept of fetching a star for a nightlight. It was fun to think about the two friends studying each star to find just the right one. The illustrations really captured my attention, especially the ones of the night sky, which evoked the feeling of staring up at the real night sky in a very dark place. The newspaper that folded up into an airplane and unfolded into a blanket was a cute and creative detail. This book offers lots of possibilities for discussion, e.g. Is it okay to take things from nature? What would you do if you got lost? It would be nice to compare and contrast this story with others about stars and space, e.g. Eric Carle’s Papa Please Get the Moon for Me or Oliver Jeffers’ How to Catch a Star. Non-fiction books about stars and space would complement this nicely, for kids who want to know more. For some companion books, Delightful Children’s Books lists 11 Children’s Books About Stars and Space. A fun exploration to go along with this would be paper airplane making using different kinds of paper. Looking at these illustrations sparked this question for me: Can you make really make paper airplanes from newspaper? A great question for students in primary grades to investigate. If you're looking for more great picture books to read to your class or to investigate as a writer, author Susanna Leonard Hill has a wonderful list of Perfect Picture Books. The books on the list are categorized by theme and topic, and each one has a link to a blog that featured it, so you can get a few ideas about the contents and ideas for using it.